We value Wildwood’s history even as we look forward! Jay and I have done a lot of talking about our current renovation plans. It started with talks between us about what we need to do and what we want for Wildwood in the long run. Then came lots of discussions with bankers and builders about whether or not our plans are wise and/or feasible. Those discussions often meant more soul-searching and discussions between us about how much OLDER we are than the last time we did a large project and, therefore, how much can we really take on?! Finally, when our minds were settled and the bank on board we spent the summer discussing our plans with our guests. Here is the future site of our new 6 bedroom duplex, the Oak Lodge. 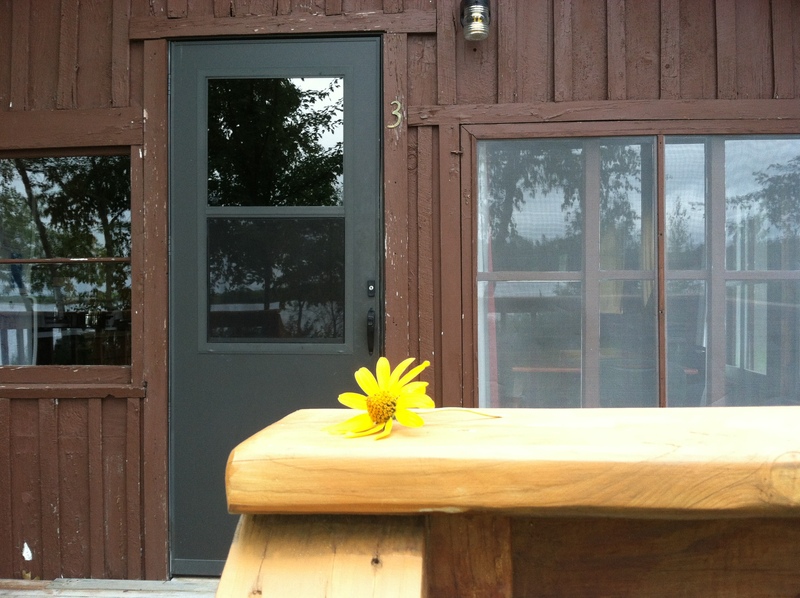 Many of our repeat customers were not surprised by our plans and were even happy to hear about the upgrades planned for Cabins 1 through 4. However, most feel really conflicted because while they look forward to level floors and larger bathrooms they mourn the loss of what the cabins signify to each of them. Jay and I have only been at Wildwood for 15 years. Many of the guests that we inherited in 1999 had already been coming to Wildwood for decades. They have witnessed the different resort owners come and go through the years and can tell us history about our property that never got transferred with the purchase. 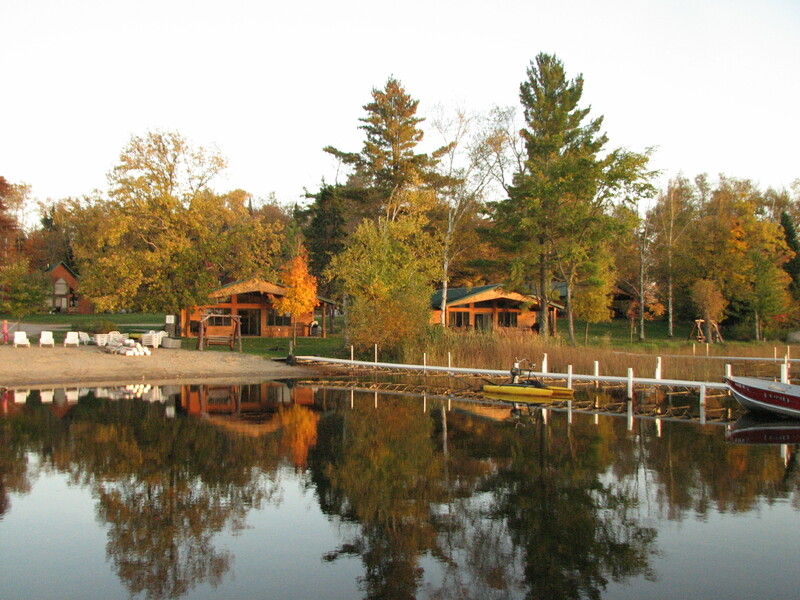 More importantly, they have lived many of their most precious memories in and around the cabins at Wildwood – memories of grandparents and parents who are now gone and memories of their grown children as toddlers and teens playing “Capture the Flag” after dark. 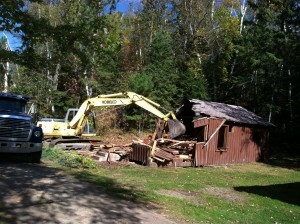 After all that talk and all the planning you would think we would be more than ready to see the old cabins gone. However, on Labor Day as I climbed the steps of Cabin 3 my eye caught an offering made by the guests who had departed that morning. Like so many of our people they have strong ties to Wildwood made more precious by the recent passing of their wonderful dad and husband. I was overwhelmed by the loss they have suffered and touched by the tribute. 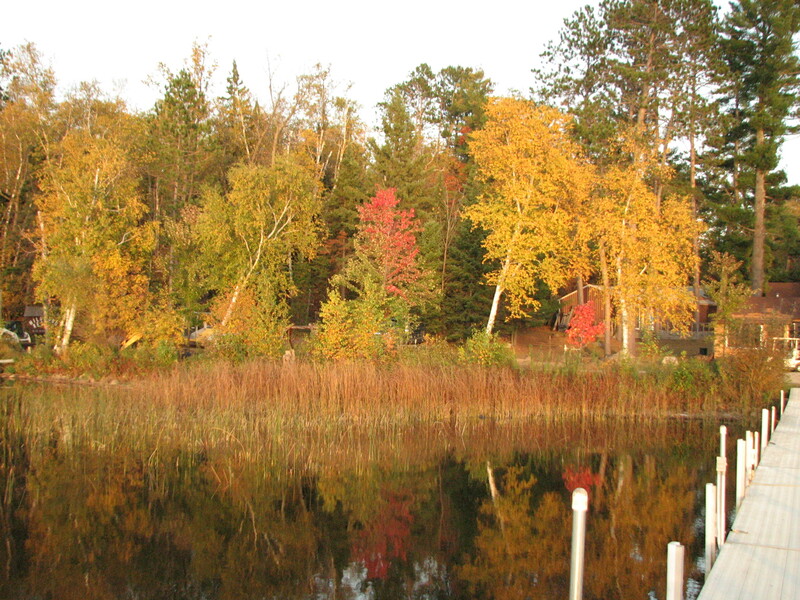 It was a reminder of the precious job we have of preserving Wildwood for future generations. Realizing that loss is part of change (they aren’t called growing “pains” for nothing) we vow to remember and continue with the long-established tradition of providing the backdrop for memories yet-to-be-made. We hope you will come along for the journey. With all that said….I should tell you where we’re at as of today. Lots has been happening this week. 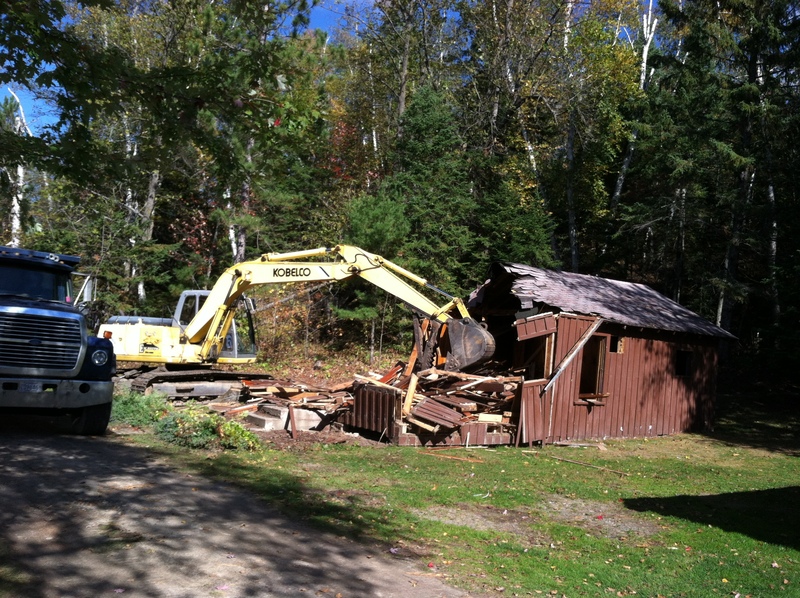 It started with the demo of Cabins 2, 3 & 4. 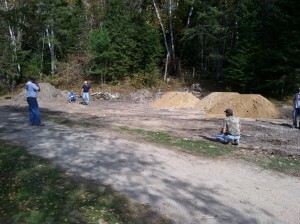 Our excavator spent the rest of the week hauling in fill and preparting the pad for Aspen Lodge. 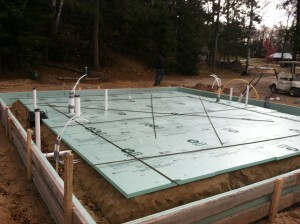 We’re looking forward to our concrete contractor coming in next week to start putting down forms for the slab. We’re very excited about the AMAZING view that our guests will have from the patio of that lovely new cabin! Our contractor came out yesterday and sited the location of the Oak Lodge duplex. Yesterday our contractor came out and sited the locations of both Aspen Lodge and the duplex. (Oak Lodge) We were pleased with the way both cabins will fit in the space we planned. Today there is lots of activity as we have someone here who is doing directional boring to take water and utilities down to the new cabins. What cool technology! 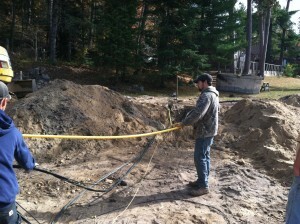 He has a machine that drills underground while communicating with equipment above ground to come up exactly where we want the utilities. 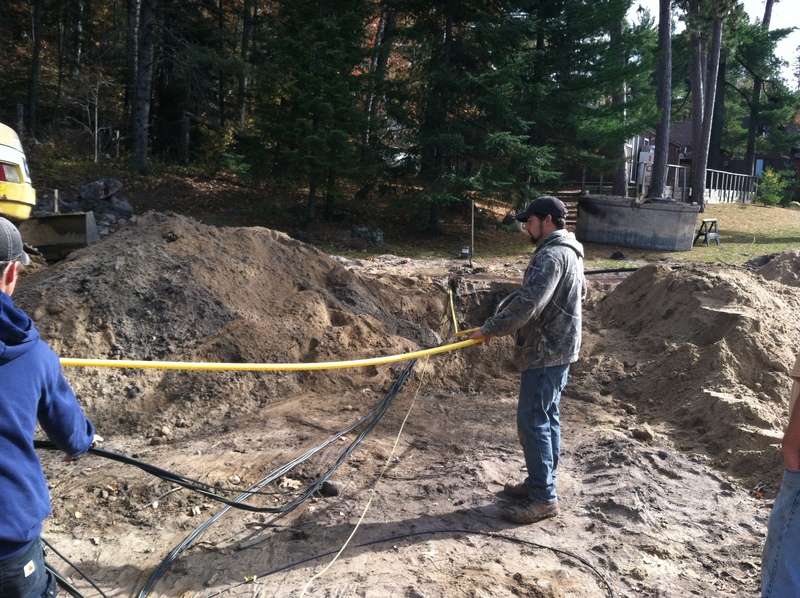 The utilities were pulled underground and that saved having to tear up the resort with trenches. It’s a very cool process!! Then all the cable, wires, water lines, etc. are pulled back through the drilled hole. It saves a ton of time and prevents a huge mess since it keeps us from having to tear up the resort when we trench in all the utilites. Next week we plan for our concrete contractor to come and set the forms for the slabs. After the forms are set we’ll wait for the plumber to lay his plumbing and the tubing for the in-floor heat. We are hoping to be able to have the concrete slabs poured before the end of the month. That’s it! You’re up-to-date on our project. Keep checking our Facebook page for videos and pictures. The fall colors have been breathtaking this week! Even with construction underway the shoreline is gorgeous!